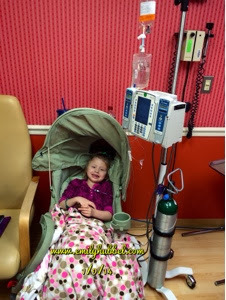 Today Emily had clinic, day 15, Avastin. This was her last day/dose of Avastin that she will ever have. It seemed kind of weird that it was her last ever and that we had 12 total rounds of it. Honestly it was almost a bittersweet moment knowing that we have depending on this the last year and it has kept her stable. I even took a picture of it, I know weird but I did. Emilys platelets were at 27 today, so she required another transfusion, hemoglobin had dropped again to 9.9, but hopefully that will pop back up. We did notice that she had some bruising going on so we figured she would need platelets. They did take blood today to check for HAMA positive. We should have the results of that in 7-10 days, so that can be reported back to Texas. Dr Gowda also let them know she didn't have any allergic reactions, so now we just wait for this. 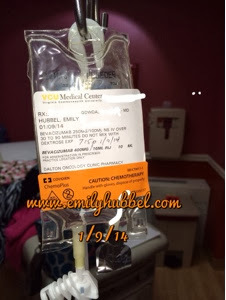 Once it comes back we can sign the consent form and send the blood so they can start working on the T cells for Emily. We did let Dr Gowda know that we have chosen not to go the ICE/high dose chemo route right now (unless scans show us progression) and that we would like to have Emily on the metronomics. So, there are 2 lose dose chemos involved with that as well as some other medicines, so as long as they hold her stable we will keep her on that until the Texas trial is available. This regimen should also allow her platelets to start coming back up, and that is what we want, give her bone marrow a break, but continue on something. Dr Gowda is going to start working on insurance approvals, and we know one of them normally takes a while from insurance. We still have not gotten a confirmation yet on scans, which has been frustrated. So hopefully we will know soon. On the way home Emily had a really bad nose bleed. It was literally 10 minutes after getting into the car to head home, I had to pull over twice to take care of her and was thankful when we arrive to Brianna's daycare that they helped me with baby wipes and napkins, because Emily has blood everywhere, Emily ended up throwing up blood because it was in her throat. When we got home it started again while she was taking a tub. She looked very pale, and the nose bleed was concerning, daddy finally got it to slow down by using a nose spray and she only had a little bit after that. Thank goodness. So she will head back to clinic next week to check counts and see how she is doing with platelets. Hopefully she will be on the up and up, but if today's nose bleeds are any sign, we may need them next week too. Please continue to keep Emily in your thoughts and love and that her platelets go up and this disease is leaving her body. This disease is horrible and continues to show its ugliness with is many children. Remember to hug and kiss your children and tell them how much you love them.